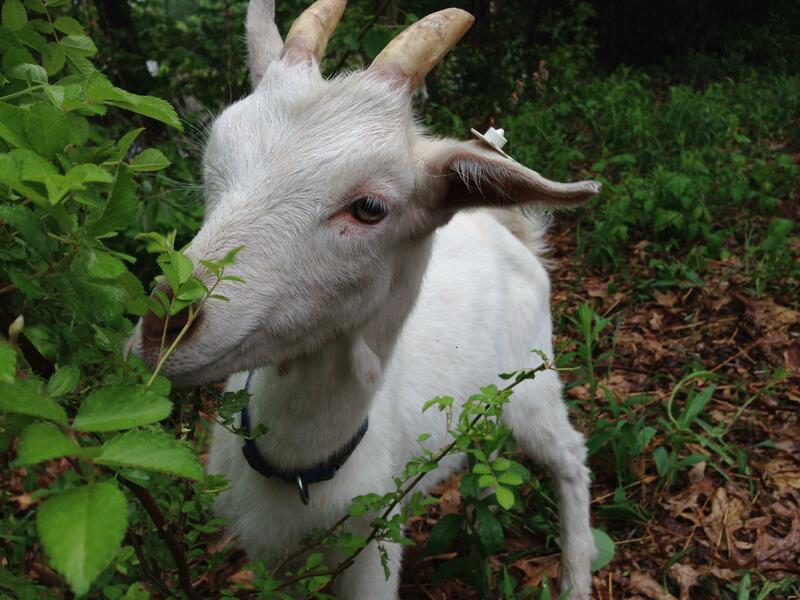 HomePoison Ivy Got Your Goat? Call Goat Girls! Poison Ivy Got Your Goat? Leaves of three, let them be. Berries white, take flight. 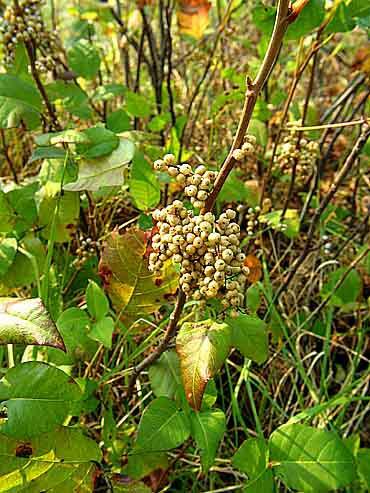 You may be surprised to learn that poison ivy is actually a native plant to New England. This fact hardly makes us feel any better about the noxious weed. Every part of the plant – root, stem, vine, leaf, flower and berry – is poisonous to human beings, causing a potentially nasty rash. Interestingly, we are the only species on the planet allergic to poison ivy. The plant releases an oil called urushiol which is responsible for the allergic reaction that can occur when it comes in contact with the skin. A person can be exposed to the oil by direct contact with the plant, by secondary contact with pets, garden tools or clothing that have been exposed to the oil, or by smoke given off by burning the plant. The rash usually appears within 24 to 48 hours after exposure. Unfortunately, poison ivy is ubiquitous across the Midwest and New England, generally growing along roadsides in sunny, cleared areas. There are two primary ways to eradicate the plant: physical removal and herbicides. Both methods have their limitations. Removing poison ivy can be risky. You need to be covered from head to toe to protect yourself from exposure to urushiol. Your clothing, gloves, and shoes will need to be washed afterward or discarded completely. There is no easy way to dispose of the plants; even the exterior of trash bags can get contaminated with urushiol, thus exposing yourself, your family, or sanitation workers. Herbicides will do the job, but they will also kill any other plant that they come in contact with, including vegetables, flowers, trees and shrubs. Plus, they are potentially harmful to people and the environment. So, what is a gardener to do? The South Hadley Community Garden has been troubled by poison ivy for a few years. According to Sue Brouillette, the Master Gardener who is leading the eradication project, during the growing season, the poison ivy that borders the gardens starts to shoot up in the garden pathways and presents a hazard to the gardeners. The gardeners have attempted to manually remove the plants, but it’s risky and requires a significant amount of labor and protective clothing. The same area is also choked with invasive plants like Asian bittersweet and Japanese knotweed. 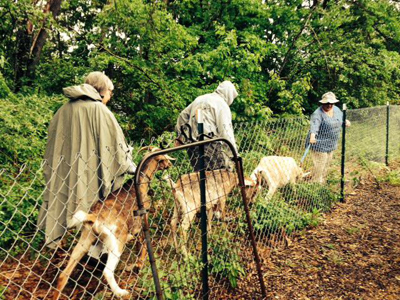 This spring, the gardeners decided on a new approach: goats. 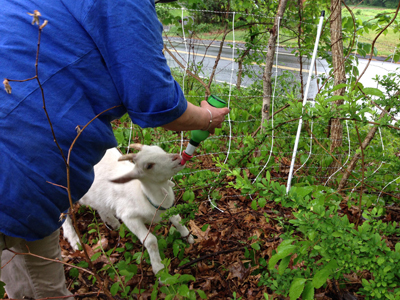 Goats are an ideal, environmentally friendly alternative for removing poison ivy and invasive plants. They like to eat a wide variety of leafy plants and woody vines, including poison ivy and multiple types of weeds. They’ll graze all day long. Goats are agile and light on their feet, climbing rocks and hills to reach out-of-the way vegetation. They are easy to transport from site to site and train well to an electric fence, making them a mobile, non-fossil fuel-consuming brush mower. Additionally, goats have a triangular-shaped mouth and will completely crush anything they eat, thus eliminating the risk of seeds passing through their digestive tract and further propagating unwanted plants. 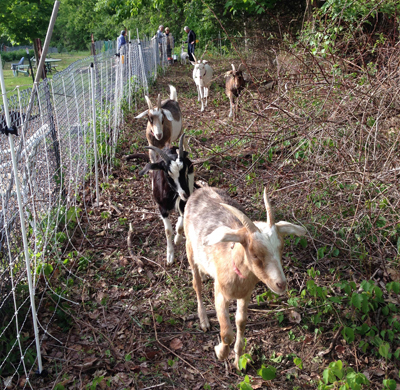 On May18, The Goat Girls, an organization based in Amherst, brought seven goats to the South Hadley gardens for seven days of hard work. The Goat Girls is the creation of Hope Crolius and the company is in its fourth year of business. The goats arrived via a bright pink truck driven by Goat Girls goatherd Joe Willie. Joe had come the previous day to prepare the site and set up the electric fence. 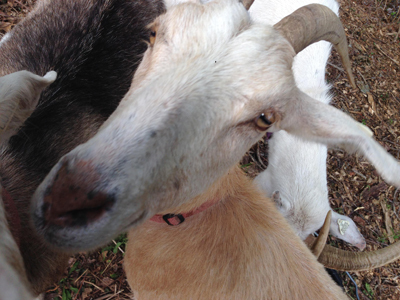 He enlisted the help of the gardeners to guide each of the goats – Crumpet, Munchkin, Amethyst, Moe, Atlas, Wilbur and Sawyer – into the fenced area. Once there, they were all business, getting right to work munching away at shrubs, weeds, saplings, and yes – poison ivy. 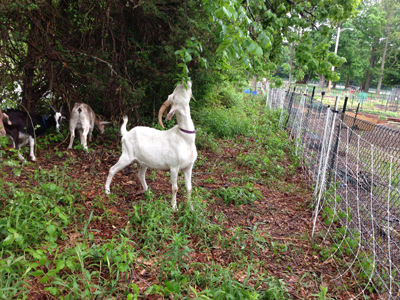 Joe, through a process of trial and error, has calculated that seven goats can take care of about 250 linear feet of brush in a few days. In the South Hadley garden, about half of the total area is fenced on the first day; in 3-4 days, the goats should be done clearing and he’ll move the fence to the second area. He has recruited a handful of gardeners who will keep watch over the goats and make sure that the electric fence is in good working order. The youngest goat, Munchkin, is only 2 ½ months old and still needs to be bottle fed twice a day. The gardeners have enthusiastically volunteered for the task. Each goat will also be put on a leash once or twice a day and led to areas outside the fence that also need to be grazed. After the goats have spent the week clearing the area, the job isn’t quite finished. Because the animals are not able to eat the roots of the plants, the gardeners will have to lay down a thick layer of cardboard and wood chips to stop any plant regrowth.